Turns out, I wasn’t quite correct. I didn’t realize that Ysolda’s design incorporates short-row shaping for the wrists. I had to rip back my work during the first day and pretty much start over. But it was worth it, because these are the best fitting mitts I’ve ever had! 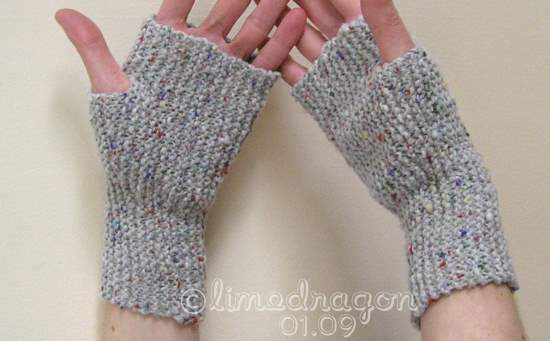 This pattern would be a good one for learning short-rows, as they only take place every 8 or 10 rows for the hand/wrist, and more frequently in the gussets. These mitts might look symmetrical, but they technically aren’t because the seam is inside the palm. Ysolda has the knitter turn the second one inside-out to become the right-hand mitt. I took a slightly different approach; I just flipped one mitt to the other side before grafting it shut. It might also be possible to follow the instructions from the bottom up to make the right-side mitt. 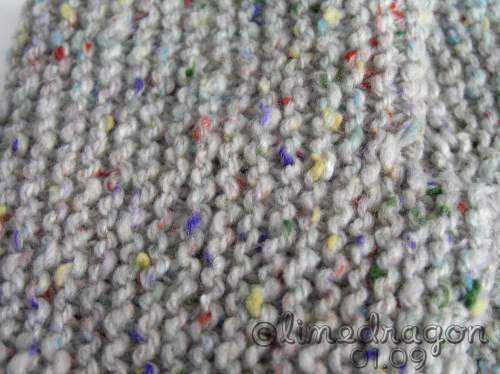 The yarn was a perfect match for this pattern, too! 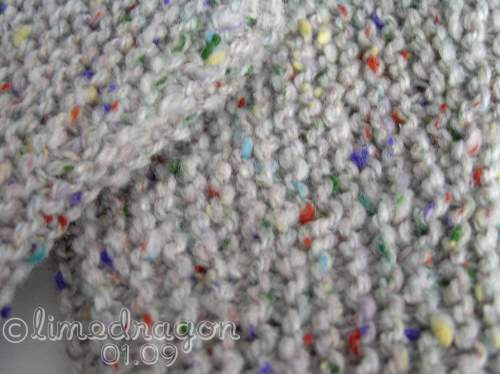 I loved looking at the various tweedy colors that popped up here and there. So fun! 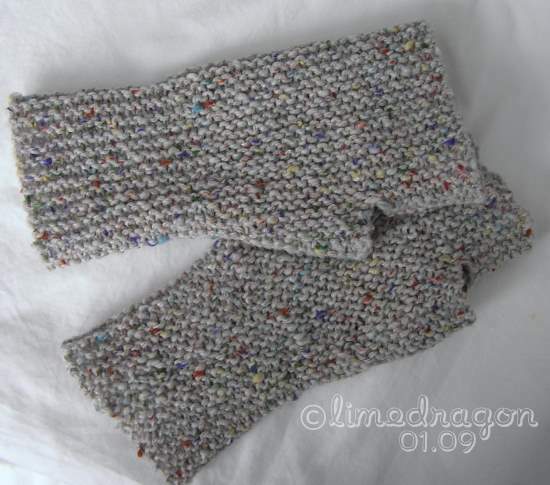 Pattern: �Garter Stitch Mitts� by Ysolda Size: Small, with large thumb gusset Yarn: Queensland Collection Kathmandu DK, color 422 (light gray) Needles: Takumi Clover US 4 (3.5 mm) circular Started: January 24, 2009 Completed: January 27, 2009 Ravel it! They do look cozy!! My fingerless mitts (from ages ago) are stockinette, knit in the round, with some short row shaping so that they are shorter in the pinky area. Those are really pretty! I love the tweediness of them too. Come to think of it, that yarn looks like my first ever skein purchased. 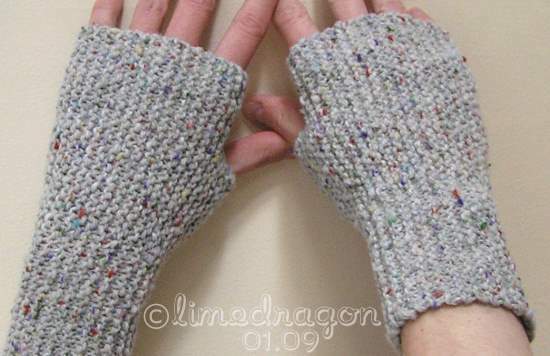 Love the mitts, one of these days I will have to knit myself some as it is flippin’ cold in the bat cave. Great mitts! I’m going to have to check out that pattern.